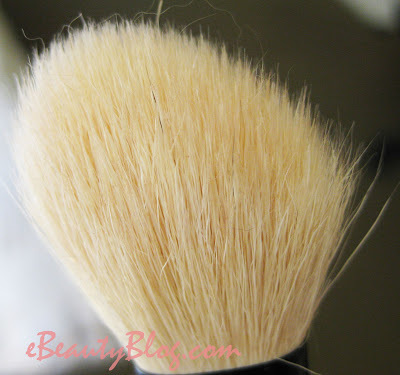 The Powder Brush: I'm giving this a 2/5 because it sheds like crazy. Regardless of how gentle I am, the hairs kept fallen off. I thought that after I cleaned it, the shedding would stop or gets better...it actually remained the same. 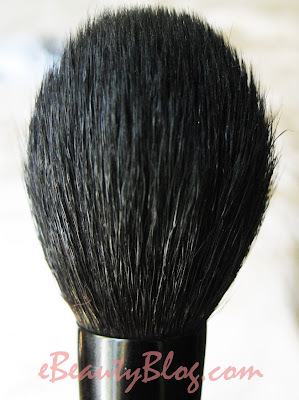 Blush Brush: This one is even worst than the powder brush. It deserves a 1/5. No, 0/5 is more like it. 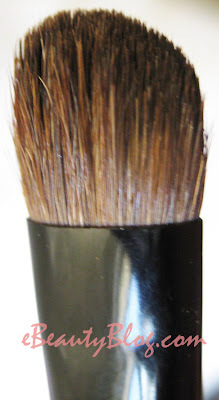 I tried to take a good close up picture of the bristle so you can get an idea of how bad the quality of this brush is. Look at all the little hairs sticking out on the tip of the brush. Well, those stick on my face when I blushed and brushed. I was going to take pictures of all the hairs that fell off but because the hair is white, it's difficult to capture on the camera. Eyeshadow Brush: On a happier note, I'm giving this brush a 4/5. The hair is soft. It doesn't shed. It doesn't smell. Loving it so far. Eyeliner Brush: 4/5. This brush is also decent. It's great to to draw perfect thin lines. Will I purchase Essence of Beauty brushes again? Probably Not. This is my first time purchasing drugstore brushes and so far I'm not very keen on the quality. But for the $10, I got 2 decent quality brushes so I wouldn't complaint much. I heard that the individual brushes are actually better in quality compare to the ones in a set. What do you think? Hey twin, this is definitely a give and take relationship between us! You saved me from lemming on this essense of beauty brush set! What's stopping me is that I have so many brushes, but since I read so much ravings about this, I was thinking of ordering them! THANK YOU!!!! I don't want to buy a set of 4 brushes and only 2 of them works ok! *Hugs* my wallet thanks YOU! haha, thats weird! cuz my doesnt shed at all! pooor you. Me and my friend love EOB brush becuz it is soft and doesnt shed. But i donno y urs do that... =[ what CVS did u went to? Aw sorry to hear about that! Personally I've never tried EOB brushes. Ecotools makes great brushes at a very cheap price! They're pretty good quality and soft. Plus all the materials they use are environmentally friendly. 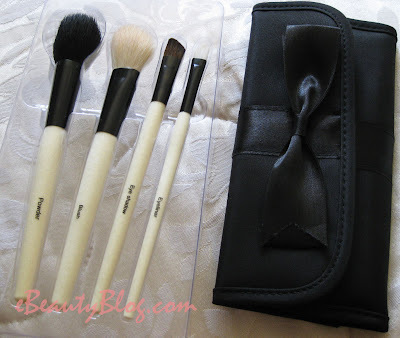 i have the same brush set, i hated the powder brush too..it shed like crazy! even when i'm not using it, whenever i touch it some of the hair comes off..like what the heck..
the eyeshadow brush i didn't like,mine didn't pick up the eyeshadows well.. 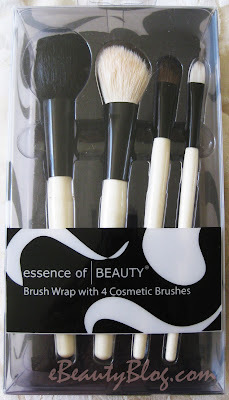 I've never gotten this pack, but I do have a few of the EoB brushes and I love them! Maybe they are better when purchased separately? sorry the brushes didnt work for you!! i know how you feel about shedding brushes... the brushes i bought from coastal scents STILL shed, lol but hey they were cheap... i just out up with it -_-;; cute brush bag tho! i've never tried their brushes before... there isn't a cvs around here... that's the only place that they're found right? Sorry these didn't work out for you. But yes, the brushes in the pack look different from the individual brushes. I have the eyeshadow brushes and crease brush that I love.